No. All four-year colleges accept both tests. Both the SAT and ACT provide concordance tables to “translate” scores from one test to another. 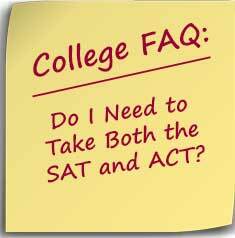 However, there are reasons why you might want to take both the SAT and ACT. Even with the proposed changes to the SAT in 2016, the tests will not be the same. Therefore, if you do poorly on one, you might do better on the other. Until 2016, the basic difference is that the SAT is considered a reasoning test while the ACT is an achievement test. Other differences include subjects covered, level of subjects, essay requirements, and penalties for guessing. You can find a variety of website that will detail the differences and their implications for the students. I like the StudyPoint table that summarizes the differences. The best thing to do is to take the practice tests offered by each and see which one you prefer. Knowing which test better suits you means that you can prepare for just one test and pay for just one test. For those who attend schools that offer both the PSAT and PLAN, taking both tests will also give you an idea of which one might be better for you. Taking these practice tests can be especially useful for those who waited until their senior year to take the tests. You only have a short time to prepare so you’ll want to spend your time on the test you’re likely to better on. And for anyone who wants to avoid spending the time and money on two test prep classes, figuring out which test for you is the way to go. Both tests provide two fee waivers for qualifying students. The SAT also allows students with fee waivers to send reports to an additional four schools other than the four that are include free with taking the tests. The ACT states that there are only a limited amount of funds so students requesting a fee waiver should consider taking the test early in the school year.